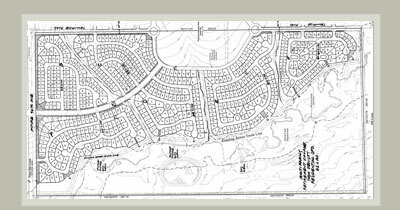 Project Data: Buffalo Highlands is a master planned community project located in the expanding Commerce City limits. More specifically the project is located at the intersection of 96th Avenue and Buckley Road. Our plans include the engineering infrastructure design to accommodate 725 units on approximately 325 acres. The majority of the units will be single family residences, however, a modest amount of duplex units are allotted in this plan. The engineering facets of this project are plentiful and diverse. Our JeHN team has prepared the design for the extension of 96th Avenue from Buckley Road to Tower Road, plans for the creation a metro district, and a design for a bridge over 2nd Creek. A CLOMR/LOMR for the 2nd Creek drainage way, coordination with Urban Drainage (2nd Creek is an Urban Drainage Channel), and regional water quality measures were necessary design requirements. Additionally, our team, the City of Commerce City, and the Rocky Mountain Arsenal collaborated on a land exchange for the creation of a "wildlife corridor".